Bolivian Houses. House hunting in Bolivia! Learn the ins and out from an expat! House Hunting is an Eye Opener! I thought I’d share my latest house hunting experience with you. If you’re considering moving to Bolivia from somewhere like the US or Canada, you’ll find that looking for a house to rent or buy is an experience you’ll never forget. Finding a house in Santa Cruz used to be very easy. But this city is currently the fastest growing city in Bolivia, (receiving immigrants from other regions of the country and from other countries to the tune of about 25,000 per month, or so I hear) so things have changed! It’s been a real trip and I couldn’t resist sharing this with you. Hopefully it’ll give you something to look forward to and you'll find my trials useful. First let me say that you could easily hire an “inmobiliaria” (a real estate agent) to help you find a house. But even then, there are things to consider that you probably wouldn’t think of taking into account if you’re not from here. Here are some of the things I’ve learned about finding a home from my own house hunting adventures in Bolivia! a)	Almost anyone can be a real estate agent in Bolivia. There are no pre-qualifying exams, no studying for 2 or more years to learn all the tax, real estate or land-ownership laws. No state certifications to acquire. You just set up an office and you’re good to go. Of course you have to register your company at the state tax office (the Renta Interna) and the corporate registration office (Fundempresa) but no one actually asks you if you are qualified to sell houses or land. When I studied for the California real estate exam it felt like law school! It is the most rigorous real estate exam in the U.S.
b)	Almost any real estate agent can offer almost anyone's house. Unlike the US where you sign an exclusivity agreement with your chosen real estate agent, in Bolivia real estate agents often take you to see houses they've simply seen in classified ads placed by homeowners. When a house is for RENT the owner may not know an agent is showing it. It's different when houses are for sale because the SELLER must pay them. Agents may see a "House for Sale" ad and ask if they can show the house and the owner only eventually pays the agent whose client buys. But they may find it's to their advantage to allow many agents to show the house. Sometimes homeowners clearly state in their ads that they don't want real estate agents to intervene. Often people looking for a house to buy or rent will also place "House Wanted" ads and also ask real estate agents to abstain from contacting them. 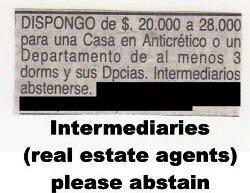 c)	Sometimes real estate agents see a house is for rent and they place their own ad for it in the classifieds! During the past week, I’ve called for information on what I thought were several different houses. I’ve been taken to the same house 4 times by 4 different real estate agents. The owner didn't know agents had placed ads on her house. She also didn't care, since she doesn't pay their commission if I rent it. d)	When you hire an inmobiliaria to do the house hunting for you, they charge you anywhere from 50% to 100% of one month’s rent as their fee. (If you purchase a house the SELLER always pays their fee, not the buyer). 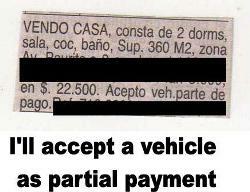 So whatever you end up paying in rent, that’s how much you can expect to pay the inmobiliaria for showing you the house. I find paying several hundred dollars for a 15-minute showing very difficult to swallow if that person does nothing to actively house hunt for me. e)	When you rent a house, you pay for a lawyer to draw up a rental contract between you and the owner of the house. The rental agent does not do this for you and is not involved in the actual rental or sales contract at all. You must go on your own (sometimes with the agent) to meet the owner and go find a lawyer. Generally speaking, a lawyer will charge about Bs. 150 (about $21) to draw up a rental contract. In addition, you have to sign a “reconocimiento de firmas” which is an extra document that is signed in front of a notary public indicating your signature is really your signature. It will cost Bs. 50 or so. Usually you do both on the same day. Usually, the homeowner will ask YOU to pay for these documents. f)	If you don’t know the city like I do, you might consider using an inmobiliaria to do your house hunting. You tell them what type of house you want, which location (or at least what kind of area) you would like to live in, what amenities you are looking for, and how much you are willing to pay. If they know of a house that matches your request, they'll show it. However, be aware that if they don't already know of one, they won't bother doing any extra research unless you are looking to purchase or if you plan to rent for $1000 months or more. Several have told me they won’t go out of their way to search for you outside of their own listing unless they consider it worth their while. That's why we offer a far superior house hunting experience! g)	The advantage of all of this is that you can easily go to 10 different real estate agents and tell them you want them to find you a house and have a lot of people looking for you all at the same time. h)	There is no such thing as a real estate listing service in Bolivia. There are real estate websites where each inmobiliaria lists the homes they want to show. There are also sites where homeowners can place general ads. But there is not really a complete, combined, or certified listing service per se. i)	You don’t sign a contract with a real estate agent at all. So you only pay the one that actually finds the house you decide upon. This is a risk for them, of course. They may show you many houses, only for you to decide upon a house someone else showed you. But they know this risk is part of their business and they are the ones who have chosen to work this way. It’s why many inmobiliarias won’t even bother to really, actively search for you unless you’re looking for a home that is worth upwards of $1000 a month. And they’ve told me this directly. Some real estate agents won’t bother with rentals at all. They only specialize in offering homes for sale. j)	If you use a real estate agent, your bargaining abilities will be severely limited. If you don’t bargain directly with the owner, you can be sure you’ll have a hard time getting the price down because the agent's pay is a percentage of the monthly rental price you will pay. This is actually also true if you’re purchasing a house despite that the owner pays this fee. k)	If you use a real estate agent, be fair to them. But also be really upfront about exactly what you are looking for and how much you are willing to pay. Your best bet – if you really need a real estate agent – is to contract with one that is well known and really trustworthy, typically one that has been recommended by someone you trust. That's why we partnered with Mario Villafan. a)	When you look through the classifieds in the newspaper and call to ask for more information about a house, your first question might be “are you the owner or a real estate agent?” By asking this first, if you already know you absolutely don’t want to pay an agent, you can thank them and hang up and not waste your time or theirs. b)	Knowing who is selling or renting the house (the owner or an agent) will give you an immediate feel for what your possible bargaining abilities and limitations might be. If it’s an owner you might have more leeway. If it’s an agent, they’ll do anything they can to keep the price up because they earn by percentages. This is not a critique. I’m just pointing out that it’s their job to do this. c)	If you’re looking for a rental among the newspaper classified ads, don’t skip over the listings under the anticrético and FOR SALE sections. Some homeowners may be open to renting a home they listed for sale, or selling a home they listed for rent, and some ads say “For sale or rent” but are listed only under one of the sections, etc. By reading all the ads, you have a greater variety of homes to look at. 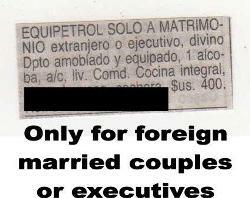 d)	When I read through classified ads I stay away from the ones that say “solo para extranjeros” (only for foreigners) or contain similar phrases. To me these send up a big bright red warning flag! Sometimes I want to just call the person who placed the ad and tell them these ads are a horrible marketing technique that will actually scare potential foreign renters or buyers away. Those homes are almost always waaaaaay overpriced. (By the way the $400 "apartment" in this particular ad was actually a miniscule one-room studio with a hot plate, in what used to be the maid's quarters in the back of a house, with no private entrance). On the other hand, these homes are sometimes equipped with amenities that are not usually offered in homes here: amenities the homeowner knows only foreigners expect. But in general, Bolivians believe foreigners are all wealthy because our incomes are above Bolivian incomes. The stereotype is that all gringos are rich and homes offered to gringos come with gringo price tags – usually double or triple what the home might be offered for to a Bolivian family. If you don’t mind this, or if you have a nice hefty income and can afford these homes, by all means take a look at them. e)	Not all homes are listed in the newspaper. One of the most time consuming (but often very effective) ways to find a home is to get in your car (or call a radio taxi and hire him/her by the hour) and go directly to a neighborhood you know you’d like to live in. Have the taxi drive slowly up and down, back and forth on each street until you’ve covered the area. Many homeowners and inmobiliarias know that people do their house hunting like this. They don’t bother paying to put an ad in the paper. Instead, they simply clip up a sign on the front gate. I’ve seen more houses this way than through ads. And I’ve not felt like it was a waste of time because I’ve gone directly to areas I know I want to live in. Classified ads often don’t list the exact location. In addition, even though I’m looking for a home to rent at this time, I’ve seen quite a few that had FOR SALE signs. Some homeowners have been willing to change their minds and rent. It’s just a matter of asking them. g)	Don’t be surprised or offended when you see ads that say things like: “only for women, only for an executive, no children allowed, only for foreigners, only for the elderly, only for a Catholic, only for someone from La Paz or Cochabamba”. Discrimination laws do exist, but are often not enforced. 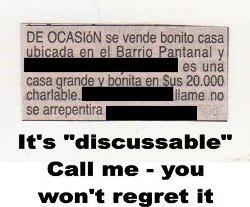 People can be very creative with their classified ads. And to be honest, sometimes I think being perfectly clear about who they are willing to rent to or not, is actually a good thing. It avoids wasted house hunting time for us. h)	About Santa Cruz specifically: be aware when you are viewing a house that right now in Santa Cruz it is very much a seller’s market. If many people are viewing the same house you are, or the owner’s cellphone is ringing off the hook during your visit, the chances of requesting a price break are almost null. The average time it takes to RENT a house or apartment in Santa Cruz right now (no exaggeration) is under 48 hours. Unless the place has real structural problems, homes are going like crazy. Two real estate agents told me last week "tienes que ir con el dinero en la mano" ("you have to go see a house with your money in your hand.") This means that if you see a home you are very interested in, you may have to make up your mind (and make a payment) right on the spot, before someone else does! I lost three good home opportunities last week because I was unwilling to be pressured into a decision on the spot. I lost one in the 1/2 hour it took me to get home after seeing the house (during which time I had decided to take the house). When I called the owner I was told she’d already rented it. I lost another right in front of me when a woman pushed past me with a bunch of money in her hand, interrupted my conversation with the home owner and said, “I’ll pay you one year in advance, here’s the money”. I lost another while visiting a home being shown by a real estate agent. While this agent was on the phone talking to the owner for me, another agent was talking to the owner’s wife for someone else. I guess the wife had the last say. j)	If you are renting an apartment, not a house, be aware that the price listed in a classified ad is usually NOT the final price. Because all apartments are actually condominiums, you must ask “cuanto son las expensas?” (how much are the building maintenance fees?) In most apartment buildings you pay monthly maintenance fees in addition to your rent. These include gardening, doorman or security salaries, pool cleaning, housekeeping of public areas, and lighting in public areas, etc. These payments are not paid to your homeowner but to the building manager (which is why they do not list this cost in their ads) and every apartment renter must pay them. Read more about utilities here. k)	Apartments are usually much safer than houses. Most houses have very high walls or gates surrounding the entire property, but homes in the nicer neighborhoods are more frequently targeted by thieves, so take that into account. If you choose to live in a house, you should 100% ask about its security features, or negotiate who would pay to add in any security features you would like the house to have. Most homes are rented “as is” so you may have to pay for additional features if you really really want the house. Take into account whether or not you think the homeowner would be able to afford to install any security systems you might want. Initially, you can offer to pay for PART of the upgrades if you think they might be willing to pay the other part. Do this before offering to pay the whole thing yourself because security systems usually will be left behind in a house once installed and they add value to the home. Homeowners know this. l)	Be aware when you are house hunting that right now the market is very competitive. The more demanding you are of a home owner (in terms of fixing things, add-ons, etc.) the less likely you are to be chosen as a renter. Unless the homeowner is very “wowed” by the idea of a foreigner renting their home (in which case you’ve probably answered one of the “foreigners only” ads) they probably won’t be willing to invest a lot to get a home ready for you. m)	Some people have no idea how to show a home. Because there is little or no training for real estate agents, very few of them have any idea how to properly show a house. Homeowners often lack the same skills. Since agents often aren't known by the homeowner, or they show you houses they found in the classifieds, they may know nothing about the house! In addition, homes are often not prepared for showing. I’ve been taken to homes that have moisture problems and have not been repaired, have rats on the lawn, are filthy and haven’t been cleaned, termites, wasp nests, overgrown weeds, broken fixtures, dirty tubs with soap rings, one had a pile of bat dung, broken furniture left in the house, have not been painted, have someone’s stuff temporarily stored in them, etc. One home I saw had an attached mechanic's shop in the back yard (see the photo). Lest you think I’ve been house hunting in slums, the truth is all of these homes have been in Equipetrol and Sirari, two exclusive and very expensive areas of town. I’ve also seen a lot of nice, clean houses. They’re not all like this. n)	You may also be shown a home while the current tenant is still living in it. You may also be shown a “semi-independiente” house which means the house may be for rent, but there may be tenants living in a backyard guesthouse or in the maid’s quarters which have been turned into another apartment which is rented separately. 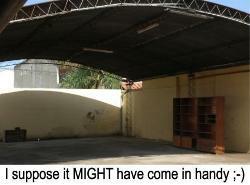 Often the back house will have a somewhat separate entrance. Be sure to ask about this! o)	Be aware that homes are sold and/or rented “as is” and without many of the commodities or amenities that we consider “normal appliances” in the US. You will not find a house or apartment with an electric dishwasher. Very few homes have clothes washers and almost none have dryers (and they are also very difficult to find in stores). Most upper-class homes have air conditioning, middle-income homes often don’t. Usually, an unfurnished house is stripped almost bare. There may be electric shower heads instead of water heaters and you may find a lot of homes don’t have hot running water. Read more about what houses in Bolivia are like here. Homes that do have all (or some) of these things are often the ones that are listed as “only for foreigners” and often prices will be comparable to US rental prices. On the other hand, you can find some really small but nice fully furnished apartments rented seasonally (by the day, week or month) to foreigners for as low as $450 a month right downtown. So when do you "show them the money"? Overall, if you’re house hunting you’ve got your work cut out for you. Your best option is to rely on recommendations from friends, co-workers and people you trust and if you choose to use the services of a real estate agent, use one that comes very well recommended or is accustomed to finding homes for foreigners. Your experience will largely depend on the support group you have. Mostly it will depend on your budget and the area you choose to search in. As anywhere, houses are priced by the PERCEIVED quality of the LOCATION. But the truth is, there are no zoning laws in Bolivia, or if there are any, they are not enforced. So you may find that the beautiful home you see in an ad is next to a discotheque, store, mechanic shop... to save time, you might want to ask about the surroundings before you agree to view a home. Drove us nuts! That's why I designed our house hunter tour! My advice? DON'T be wowed by location (which translates into high prices)!! Plenty of very exclusive neighborhoods have pretty high crime rates - like Equipetrol, Las Palmas and Urbarí in Santa Cruz, or Aranjuez, Obrajes, Sopocachi and Calacoto in La Paz. In these neighborhoods, robberies are frequent precisely because they are exclusive and foreigners are especially targeted. Some neighborhoods that don't look so great on the outside (and some homes that have awful looking exterior walls) are beautiful, peaceful and safe on the inside. Be aware that as a general rule (there are exceptions) homes both for rent and sale tend to drop in price as you get farther from downtown but this depends. For example, you can rent a gorgeous house in Las Palmas, just 10 minutes from downtown Santa Cruz for $3000 a month or a FULLY comparable home with all the same amenities in Ciudad Jardín 6 miles from the center for under $1500 a month. In La Paz, for example, it's the opposite: the exclusive areas of the city are far from downtown in the Zona Sur. There you can rent for similar prices in Calacoto or 3 times LESS in Obrajes, which is actually nearer to downtown. Be prepared for some real surprises. Bolivia has no zoning laws. I’ve seen mansions next to karaoke bars and open markets, and little gems of houses squished between horrible huge buildings. I’ve seen really large homes for very small prices and very tiny homes for extremely inflated prices. So what can you do in a seller’s market where you’re pressured to make an on the spot decision or risk losing a house you really like? Calm down and have faith! Don’t be afraid to be creative! For the right price and the right renter (or buyer) people are willing to make some allowances, negotiate prices, and even work on exchange! See this ad? You can place ads or make creative offers too. Have patience, don’t be pressured, take a look at a nice large variety of homes, and go ahead and lose an opportunity with a house or two. New options will come up every day and there are lots of very nice ones. Be calm. Does this all sound too overwhelming? I'm sure this was a fun read and you got a good laugh, but it's no laughing matter, nor is it surprising to me, to hear how many foreigners feel so overwhelmed when searching for homes in Bolivia. It's very difficult even for those of us who've lived here for many years. BoliviaBella Expat Services will do your house hunting for you, set up all your utilities in your new home, help you apply for residency, and more. Still think you'd rather work alone? We offer a House Hunter Tour of the city just so you can get a feel for where you might want to live, even if you ultimately do your actual house hunting on your own. Read more about this and all of the expat services we offer.